The global oil and gas giant missed earnings expectations, reported a 3% decline in oil production, and lost money on its U.S. production, adjusted for some one-time items. Shares of ExxonMobil Corporation (NYSE:XOM) fell 5.1% on Feb. 2. While a lot of the market's attention was on the 2.1% and 2.5% drop for the S&P 500 and Dow Jones Industrials on the day -- the worst single-day for both indices in nearly a year -- ExxonMobil suffered its worst single day since 2011. The biggest driver for ExxonMobil's bad day was a fourth-quarter earnings release that left analysts and investors wanting. On the surface, its $8.4 billion profit might look good, but almost $6 billion of that was a one-time benefit related to the Tax Act, the federal tax legislation passed in late 2017 lowering the corporate income tax rate. Adjusting for this one-time non-cash gain, ExxonMobil reported $0.88 per share in profits, well below the $1.03 were looking for. The lower tax rate will provide a recurring boost for ExxonMobil going forward, but the substantial gain the company recorded in the fourth quarter is far higher than what the company will actually realize in future quarters under the new tax law, so investors pay attention to the adjusted results. But a big part of the story investors shouldn't ignore is that the company's oil production declined in the fourth quarter, falling 130,000 barrels, or 3.2%, with a lot of that decline in North America. Actually, U.S. production fell by 244,000 barrels, with growth in other areas offsetting some of those declines. The company has started to reprioritize its U.S. production recently, having announced before earnings that it would invest $50 billion in the U.S. over the next five years. 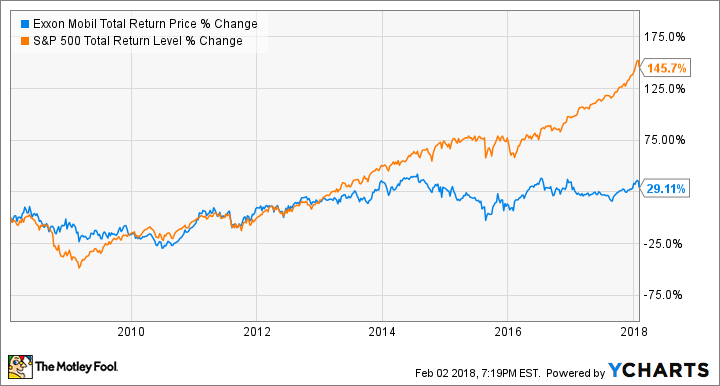 And while they're up 32.5% in total returns from the low point in mid-2015, the S&P 500 has delivered 54% in total returns over the same period. So, what does it all mean for the future? It's hard to say. Historically, ExxonMobil has delivered some of the best returns on capital and assets in the energy industry, but it seems its scale isn't delivering for investors as it has in the past. At the same time, it represents an intriguing value, particularly with its plans to reignite growth in the U.S., and the boost to its bottom line that the Tax Act will provide. I'm not ready to count the biggest of the Big Oil players out just yet, but I do think there are better investments in the energy sector today, starting with Royal Dutch Shell (NYSE:RDS-A)(NYSE:RDS-B). Shell may not be as cheap, but its growth plan is working and it yields a 47% higher payout on its dividend (5.3%, versus 3.6% for ExxonMobil). My suggestion is to keep ExxonMobil on your watchlist for now, and take a closer look at Shell with money you want to invest now. If ExxonMobil can stabilize its production and start growing earnings and cash flows again, it may be worth buying. It's just not there today.